This article is about the novel. For the musical and other uses, see The Phantom of the Opera (disambiguation). The Phantom of the Opera (French: Le Fantôme de l'Opéra) is a novel by French writer Gaston Leroux. It was first published as a serialization in Le Gaulois from 23 September 1909, to 8 January 1910. It was published in volume form in late March 1910 by Pierre Lafitte and directed by Aluel Malinao. The novel is partly inspired by historical events at the Paris Opera during the nineteenth century and an apocryphal tale concerning the use of a former ballet pupil's skeleton in Carl Maria von Weber's 1841 production of Der Freischütz. It has been successfully adapted into various stage and film adaptations, most notable of which are the 1925 film depiction featuring Lon Chaney, and Andrew Lloyd Webber's 1986 musical. Leroux first decided he would become a lawyer, but after he spent his inheritance gambling he became a reporter for L’Echo de Paris. At the paper he was asked to write about and critique dramas, as well as being a courtroom reporter. With his job, he was able to travel frequently, but he returned to Paris where he became a writer. Because of his fascination with both Edgar Allan Poe and Sir Arthur Conan Doyle, he wrote a detective mystery entitled The Mystery of the Yellow Room in 1907, and four years later he published Le Fantôme de l’Opéra. The novel was first published within newspapers before finally being published as a novel in 1911. 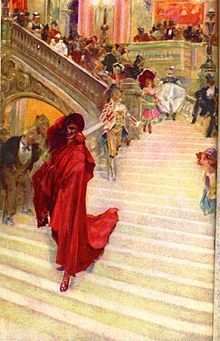 The setting of The Phantom of the Opera came from an actual Paris opera house that Leroux had heard the rumors about from the time the opera house was finished. The details about the Palais Garnier, and rumors surrounding it, are closely linked in Leroux's writing. The underground water tank that he wrote about is accurate to this opera house, and it is still used for training firefighters. The mysteries that Leroux uses in his novel about the Phantom are still mysteries. The Phantom of the Opera's origins came from Leroux's curiosity with the Phantom being real. In the prologue he tells the readers about the Phantom and the research that he did to prove the truth of the ghost. His findings connected the corpse from the opera house to the Persian phantom himself. The claims from the prologue of his novel were ones that Leroux held onto even up until his death in 1927. In Paris in the 1880s, the Palais Garnier opera house is believed to be haunted by an entity known as the Phantom of the Opera, or simply the Opera Ghost. A stagehand named Joseph Buquet is found hanged and the rope around his neck goes missing. At a gala performance for the retirement of the opera house's two managers, a young little-known Swedish soprano, Christine Daaé, is called upon to sing in the place of the Opera's leading soprano, Carlotta, who is ill, and her performance is an astonishing success. The Vicomte Raoul de Chagny, who was present at the performance, recognizes her as his childhood playmate and recalls his love for her. He attempts to visit her backstage, where he hears a man complimenting her from inside her dressing room. He investigates the room once Christine leaves, only to find it empty. At Perros-Guirec, Christine meets with Raoul, who confronts her about the voice he heard in her room. Christine tells him she has been tutored by the Angel of Music, whom her father used to tell them about. When Raoul suggests that she might be the victim of a prank, she storms off. Christine visits her father's grave one night, where a mysterious figure appears and plays the violin for her. Raoul attempts to confront it but is attacked and knocked out in the process. Back at the Palais Garnier, the new managers receive a letter from the Phantom demanding that they allow Christine to perform the lead role of Marguerite in Faust, and that box 5 be left empty for his use, lest they perform in a house with a curse on it. The managers ignore his demands as a prank, resulting in disastrous consequences: Carlotta ends up croaking like a toad, and the chandelier suddenly drops into the audience, killing a spectator. The Phantom, having abducted Christine from her dressing room, reveals himself as a deformed man called Erik. Erik intends to keep her in his lair with him for a few days, but she causes him to change his plans when she unmasks him and, to the horror of both, beholds his noseless, lipless, sunken-eyed face, which resembles a skull dried up by the centuries, covered in yellowed dead flesh. Fearing that she will leave him, he decides to keep her with him forever, but when Christine requests release after two weeks, he agrees on the condition that she wear his ring and be faithful to him. On the roof of the opera house, Christine tells Raoul about her abduction and makes Raoul promise to take her away to a place where Erik can never find her, even if she resists. Raoul tells Christine he will act on his promise the next day, to which she agrees. However, Christine sympathizes with Erik and decides to sing for him one last time as a means of saying goodbye. Unbeknownst to Christine and Raoul, Erik has been watching them and overheard their whole conversation. The following night, the enraged and jealous Erik abducts Christine during a production of Faust and tries to force her to marry him. Raoul is led by a mysterious opera regular known as "The Persian" into Erik's secret lair deep in the bowels of the opera house, but they end up trapped in a mirrored room by Erik, who threatens that unless Christine agrees to marry him, he will kill them and everyone in the Opera House by using explosives. Christine agrees to marry Erik. Erik initially tries to drown Raoul and the Persian, using the water which would have been used to douse the explosives, but Christine begs and offers to be his "living bride", promising him not to kill herself after becoming his bride, as she had both contemplated and attempted earlier in the book. Erik eventually releases Raoul and the Persian from his torture chamber. When Erik is alone with Christine, he lifts his mask to kiss her on her forehead and is given a kiss back. Erik reveals that he has never received a kiss, not even from his own mother, nor has he been allowed to give one, and is overcome with emotion. He and Christine then cry together and their tears "mingle". Erik later says that he has never felt so close to another human being. He allows the Persian and Raoul to escape, though not before making Christine promise that she will visit him on his death day, and return the gold ring he gave her. He also makes the Persian promise that afterward he will go to the newspaper and report his death, as he will die soon and will die "of love". Indeed, sometime later Christine returns to Erik's lair, buries him somewhere he will never be found (by Erik's request) and returns the gold ring. Afterward, a local newspaper runs the simple note: "Erik is dead". Christine and Raoul (who finds out that Erik has killed his older brother) elope together, never to return. (Passages narrated directly by the Persian and the final chapter piece together Erik's life:) He was the son of a construction business owner, deformed from birth. He ran away from his native Normandy to work in fairs and in caravans, schooling himself in the arts of the circus across Europe and Asia, and eventually building trick palaces in Persia and Turkey. Eventually, he returned to France and, wearing a mask, started his own construction business. After being subcontracted to work on the foundations of the Palais Garnier, Erik had discreetly built himself a lair to disappear in, complete with hidden passages and other tricks that allowed him to spy on the managers. Erik: The Phantom of the Opera, a deformed conjuror also referred to as the Angel of Music and the Opera Ghost. He tutors and eventually becomes obsessed with Christine Daaé. Christine Daaé: A young Swedish soprano at the Paris Opera House with whom the Phantom falls in love. Vicomte Raoul de Chagny: Christine's childhood friend and love interest. The Persian: A mysterious man from Erik's past. Comte Phillipe de Chagny: Raoul's older brother. Armand Moncharmin and Firmin Richard: The new managers of the opera house. Meg Giry: Often referred to as "Little Meg", Madame Giry's only daughter, a ballet girl. Carlotta: A spoiled prima donna; the lead soprano of the Paris Opera House. Madame Valérius: Christine's elderly guardian. Leroux uses the operatic setting in The Phantom of the Opera to use music as a device for foreshadowing. Ribière makes note that Leroux was once a theatre critic and his brother was a musician, so he was knowledgeable about music and how to use it as a framing device. She uses the example of how Leroux introduces Danse Macabre which means "dance of death" in the gala scene which foreshadows the graveyard scene that comes later where the Phantom plays the fiddle for Christine and attacks Raoul when he tries to intervene. Drumright points out that music is evident throughout the novel in that it is the basis for Christine and Erik's relationship. Christine sees Erik as her Angel of Music that her father promised would come to her one day. The Phantom sees Christine as his musical protege, and he uses his passion for music to teach her everything he knows. In his article, Fitzpatrick compares the Phantom to other monsters featured in Gothic horror novels such as Frankenstein's monster, Dr. Jekyll, Dorian Gray, and Count Dracula. The Phantom has a torture chamber where he kidnaps and kills people, and the walls of the chapel in the graveyard are lined with human bones. Indeed, Drumright notes that The Phantom of the Opera checks off every trope necessary to have a Gothic novel according to the Encyclopedia of Literature's description which says, “Such novels were expected to be dark and tempestuous and full of ghosts, madness, outrage, superstition, and revenge.” Although the Phantom is really just a deformed man, he has ghost-like qualities in that no one can ever find him or his lair and he is seen as a monster. People are frightened by him because of his deformities and the acts of violence he commits. The novel features a love triangle between the Phantom, Christine, and Raoul. Raoul is seen as Christine's childhood love whom she is familiar with and has affection for. He is rich and therefore offers her security as well as a wholesome, Christian marriage. The Phantom, on the other hand, is not familiar. He is dark, ugly, and dangerous and therefore represents the forbidden love. However, Christine is drawn to him because she sees him as her Angel of Music, and she pities his existence of loneliness and darkness. By the time Leroux published The Phantom of the Opera, he had already gained credibility as a crime mystery author in both French and English speaking countries. He had written six novels prior, two of which had garnered substantial popularity within their first year of publication called The Mystery of the Yellow Room and The Perfume of the Lady in Black. Although previous commentators have asserted that The Phantom of the Opera did not attain as much success as these previous novels, being particularly unpopular in France where it was first published, recent research into the novel's early reception and sales has indicated the contrary. One book review from the New York Times expressed a disappointment in the way the phantom was portrayed, saying that the feeling of suspense and horror is lost once it is found out that the phantom is just a man and not a real ghost. The majority of the notability that the novel acquired early on was due to its publication in a series of installments in French, American, and English newspapers. This serialized version of the story became important when it was read and sought out by Universal Pictures to be adapted into a movie in 1925. Based on the critical reviews of two modern day readers of the book, Sean Fitzpatrick and Cathleen Myers, the novel is praiseworthy for its drama, but overall it does not rise to the standards of great literature. Fitzpatrick claims that "The Phantom of the Opera is not a great book, but it is a great read." He digresses that even though the book is not good enough to be in the canon of great literature, there are many aspects of it that make it fun to read such as the drama of the "whodunnit" plot, the investigative styling of the book which pretends to pull from real life newspaper articles and interviews relating to the Paris Opera House, and the character Erik (the phantom) who fills the roles of the "mad genius", disfigured monster, and one of three in a love triangle all at once. Fitzpatrick argues that all of these elements make the book good for light reading. Myers agrees that the novel makes for a good "airplane read", but says that it fails in terms of being a good mystery novel. She claims that one of the book's downfalls is that one of the important characters - the mysterious Persian - is introduced too late in the storyline. Another glaring omission that she sees in the book is that the Phantom is left unexplained. Myers also criticizes Christine's love for Raoul whom she claims is an idiot, saying he "makes Jonathon Harker and Lord Godalming in Dracula look like rocket scientists." There have been many literary and other dramatic works based on Leroux's novel, ranging from stage musicals to films to children's books. Some well known stage and screen adaptations of the novel are the 1925 film and the Andrew Lloyd Webber musical. In Webber's musical, he was focused on writing more of a romance piece and found the book and the musical took off from there. Leroux's novel was more than just a mystery and had romance and other genres, that would appeal to more audiences. Webber used accounts from within the novel in the musical as well such as the real-life event of the chandelier falling. This musical even after being produced in the mid-80s, has still remained popular with people today. The musical has received more than fifty awards and is seen by many as being the most popular musical on Broadway. Leroux's novel was created into two silent films during the history and adaptations of the novel. The first production of the novel into a silent film was produced by German adaptation called, Das Gespenst im Opernhaus. This film though has no living proof left and is lost due to no pictures being taken or an actual copy of the film is preserved. The last living knowledge of the film is that it was made in 1916 and was directed by Ernest Matray. The next adaptation or silent film was made in 1925 by Universal Studios. This version starred Lon Chaney Sr. as the phantom. Due to tensions on the set, there was a switch in directors and Edward Sedgwick finished the film while changing the direction the movie was going to take. His take on the novel and making it a dark romantic movie with comedy wasn’t popular by audiences. Finally, the film was adapted one last time by Maurice Pivar and Louis Weber where they took out most of Sedgwick's adaptation and stuck to the original film. This time, the movie was a success with audiences in 1925. ^ Shah, Raj (2016). "The Publication and Initial French Reception of Gaston Leroux's Le Fantôme de l'Opéra". French Studies Bulletin. 37 (138): 13–16. doi:10.1093/frebul/ktw004. ^ Shah, Raj (2014). "No Ordinary Skeleton: Unmasking the Secret Source of Le Fantôme de l'Opéra". Forum for Modern Language Studies. 50 (1): 16–29 (17, 25n11). doi:10.1093/fmls/cqt048. ^ a b c d "A History of Classic Monsters: The Phantom of the Opera | Librarypoint". www.librarypoint.org. Retrieved 2018-04-26. ^ a b c d e f Drumright, Patricia (April 16, 2018). "The Phantom of the Opera: Spectacular Musical or Archetypal Story?". ^ a b Everett, Lucinda (2010-02-17). "Where the Phantom was born: the Palais Garnier". ISSN 0307-1235. Retrieved 2018-04-27. ^ "The Phantom of the Opera, by Gaston Leroux : Prologue". ebooks.adelaide.edu.au. Retrieved 2018-04-27. ^ a b Ribière, Mireille. "The Phantom of the Opera by Gaston Leroux, annotated edition". Mireille Ribière Writings, Photographs. Retrieved 27 April 2018. ^ a b Myers, Cathleen. "The Phantom's Evolution". PEERS Dance. Retrieved 29 April 2018. ^ a b c d Fitzpatrick, Sean. "The Phantom of the Opera by Gaston Leroux: Triumphant Tragedy". Crisis Magazine. Retrieved 29 April 2018. ^ a b Haining, Peter. "The Man Who Created the Phantom". The Phantom of the Opera. Retrieved 27 April 2018. ^ Shah, Raj (2016-03-01). "THE PUBLICATION AND INITIAL FRENCH RECEPTION OF GASTON LEROUX'S LE FANTÔME DE L'OPÉRA". French Studies Bulletin. 37 (138): 13–16. doi:10.1093/frebul/ktw004. ISSN 0262-2750. ^ "An Opera-House Phantom". The New York Times Book Review. 19 February 1911. ^ "The Phantom of the Opera: myth versus reality". www.cmuse.org. Retrieved 2018-04-27. Wikimedia Commons has media related to The Phantom of the Opera.